Evolutionary biologist Michael Rose, professor at University of California, Irvine, says he has discovered a natural way to achieve “biological immortality” without the use of anti-aging drugs and stem cell treatments. The term “biologically immortality” in gerontology is not to be confused with the Greek idea of immortality, or a god-like sense of living forever. It’s the point in which the exponential increase in mortality rates of a species population appears to level off, producing a sudden late-life plateau. It’s an hypothesis that he supports in detail in his forthcoming book, Does Aging Stop?, co-authored with Casandra L. Rauser and Laurence D. Mueller (Spring 2011, Oxford University Press). Humans eventually achieve this period of non-aging, the authors suggest, just as several other multicellular living forms do, such as a creosote bush growing in the Mojave desert that has lived for longer than 10,000 years, and other long-lived organisms, including some animals. “The fact that such a diversity of eukaryotic [all life forms except bacteria] organisms can have indefinite lifespan shows you that there is precisely nothing about eukaryotic cell or molecular biology that requires an aging process,” Rose said, countering the “Aristotelian” view that aging is an inevitability, caused primarily by an accumulation of molecular damage and decline in physical function. Rose argues that an organism ages because the process is a byproduct forced upon us by evolution by natural selection—governed by the passing on of genes. That’s because across evolutionary species in eukaryotes, the genes selected generally favor survival of the young in a population, and then mortality rates begin to rise exponentially. “This is why you are all aging,” Rose said. He began his work on fruit flies by tricking natural selection to produce what eventually became “Methuselah flies,” for which he is well known. The trick? Take the eggs from fruit flies that have maintained enough of their physiological function to reproduce in old age, and repeat. Selection for late-life reproduction eventually made longer-lived fruit flies. This delayed-reproduction lineage, Rose showed, lives up to five times longer than average. “Hugh Heffner would love it,” he quipped. Even better, the aging phase eventually passes, Rose explained, and survival reaches a plateau, which is when the biological immortality phase starts. The chances of dying become constant, neither increasing or decreasing, a period of no more aging. 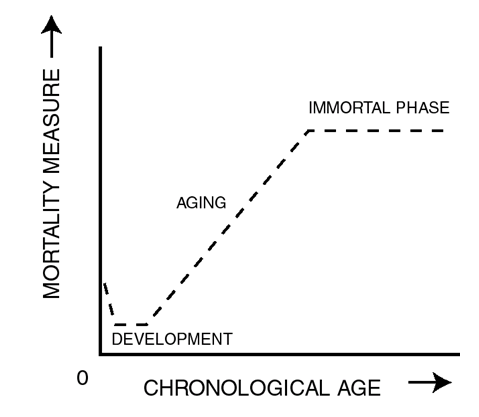 Rose was originally doubtful of this model of aging because it was contrary to the Gompertz model, which has it that mortality increases exponentially with age and is unrelenting. But then he realized that natural selection’s evolutionary pressures would stop falling, and allow a period of later biological immortality. For us, instead of his fruit flies, he has put together what he calls his “natural immortality plan,” one that he hypothesizes can keep us living far beyond the old-age record of Jeanne Calment, who lived until age 122. Calment inspired Rose’s new plan—because before the immortality phase theory, there was no reason for why she or other supercentenarians could survive so long. He explained that Calment may have reached a phase where physical decline stabilized. And, as Rose showed in fruit flies, aging can potentially remain stabilized indefinitely. 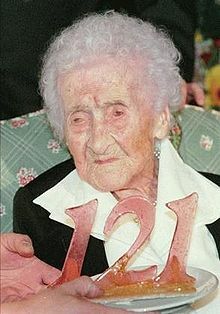 However, Rose explained that the unfortunate problem for humans is that they have a rough and long aging phase. “We hit late-life immortality plateaus very late in life, in our nineties—in your eighties you’re still aging—and we do so in terrible condition,” he said. “But,” he added, “there are good reasons theoretically that hunter-gatherer populations are more like fruit flies which hit immortality plateaus quite early. That, in fact, they might hit their transition from aging to late-life immortality perhaps in their fifties or sixties and do so in better shape. He explained, “When you have an earlier likelihood of death from somebody’s spear in the back or because you can’t cope with infection, immortal phases should start earlier. So Rose suggests a fast route to the immortality phase. “The key is not to slow the rate of aging, but go directly to the immortal phase at a lower rate of mortality, which is exactly what the fruit flies do,” he said. That excludes an industrial lifestyle and a Western-style diet that involves sitting several hours in front of a TV or computer and munching on Twinkies, he explained. Instead, adopt an ancestral hunter-gatherer lifestyle and diet (the paleolithic, or “paleo” diet). A paleo diet is a regimen that includes only foods available before the agricultural revolution of the Neolithic, which includes lean meats, shore-based foods, fruits and vegetables. Foods that became available after the Neolithic such as grains, dairy, and processed foods are all avoided. What this suggests is that the ancestral hunter-gatherer diet is best viewed as a late-life aging therapy. In combination with modern medicine and future breakthroughs of the next 10 to 15 years, that could allow you to join the exclusive club of supercentenarians — or beyond. Adopt a hunter-gatherer lifestyle after 35 to 40 if Eurasian, earlier if ancestry is less Eurasian. If younger than 30 and Eurasian, continue on a post-agricultural revolution diet (or Andrew Weil-style diet). The paleo diet, sometimes called the “caveman diet,” is one that mimics the diet of our ancestral hunter-gatherer ancestors in the Paleolithic era before the advent of the agricultural revolution of the Neolithic and animal husbandry. It includes meats, seafoods, fruits, nuts, and vegetables. It excludes processed foods (including meats), grain-derived foods such as pasta and breads, and dairy-derived foods such as milk, yogurt and cheese. Proponents of the diet such as Loren Cordain and S. Boyd Eaton argue that the agricultural revolution caused an “evolutionary discordance” between diet and our “genetically determined biology” as shaped through evolution. Andrew Weil, MD, of the University of Arizona, has authored several popular articles and books about health and diet, including best-sellers Eating Well for Optimum Health and Healthy Aging. He also has a popular Web site. The “Andrew Weil diet” is one in accordance with more conventional advice from dietitians and nutritionists. It includes eating whole grains, fruits and vegetables (50 to 60 percent of calories); fats largely derived from monounsaturated and polyunsatured oils (30 percent of calories); and protein (10 to 20 percent of calories) mainly from vegetarian sources such as soy. He also recommends eating 40 grams of fiber a day and receiving calcium from dairy or from other sources such as vegetables.